Jan finished her teaching with us last night and we had a very enjoyable evening. We danced – For Lack of Silver, Gaelforce Wint, The Saltire Strathspey, The Missing Turn, Calanais Stones and Seton’s Ceilidh Band. In January and February we get quite a few visitors as other classes have not started for the year yet. Dances were (with some step practice exercises) – The Sorcerer, Bristol Fashion, The Dancers Wedding, Clutha and The Miller of Sessine. Thank you Jan, we enjoyed our evening with you. A warm January evening saw the class, with some visitors, pace itself through Follow Me Home, Festival Interceltique, City of Belfast, The Fireworks Reel and Come to the Ceilidh. 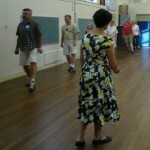 Our first class back for the year saw the hall filled with 18 dancers eager to start the New Year off with some dancing. 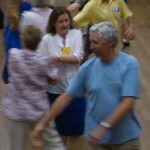 Jan took the class through Over the Rainbow, Lady Home’s Jig, Kildonan Sands, The Calanais Stones and Granville Market.